Located on the Central Pacific. Manuel Antonio and Quepos offer fishermen one of the top locations for inshore sea fishing in Costa Rica. The highly active and easy to reach fishing grounds offer great year-round action with Roosterfish, and more. Inshore conventional methods, bottom fishing or trolling, we are ready to help make your sportfishing adventure a successful and memorable one. We know the hottest areas for fishing in the Central Pacífic and the best time of year. We'll hook you up with the country's top fishing charter captains. Zapata Fishing offers complete Sea Fishing | Inshore Fishing Packages. We have been here for more than 20 years. 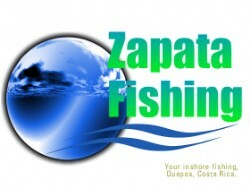 Zapata Fishing offers both experienced and first-time anglers quick, personalized service at competitive prices. We will help make your Costa Rica fishing vacation an unforgettable experience. Our driver will pick you up and take you and your group to the destination to fish. If you need help to choose a good place to stay here, we carefully select angler-friendly beachfront hotels and fishing lodges. Thanks to our clients to share us your videos and photos.